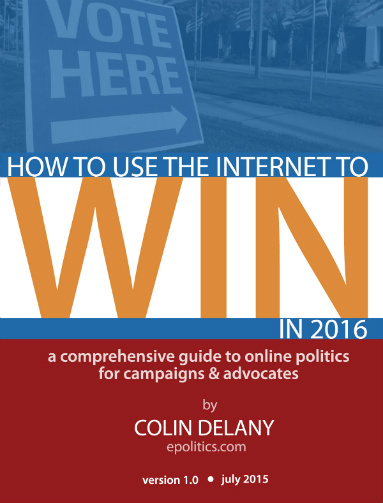 The following is an excerpt from the new ebook, “How to Use the Internet to Win in 2014: A Comprehensive Guide to Online Politics for Campaigns & Advocates”, available in the Amazon store for the Kindle e-reader and as a PDFn Epolitics.com. The explosion of Twitter marks one of the biggest changes in the digital political landscape in the last few years — in 2008, Barack Obama had all of 100,000 followers by Election Day, a number that was well above 20 million on Election Day 2012. Though the Twitter and Faceook are often lumped together in the popular mind, Twitter isn’t quite a mass medium in the same way Facebook has become — it’s more of a channel to reach those“influentials” like bloggers, journalists and activists. Also different: you can pretty much post as often as you want on Twitter, while you’ll probably want to limit yourself on Facebook to keep from burning out your audience. An example of Twitter’s ability to influence the political discussion? In 2012, Obama and Romney campaign staff regularly engaged in “Twitter duels” online, with reporters and activists the intended audience. Though these back-and-forth exchanges probably didn’t change any votes, they got plenty of media attention — mission accomplished. Functionally, Twitter is the very short equivalent of blogging, with a dash of social networking thrown in: individual Twitter messages (“tweets”) are limited to 140 characters in length, and people generally have to choose to “follow” someone’s Twitter feed in order to see their updates. As with Facebook, essentially anyone or any organization can create a Twitter feed, but in some sense Twitter lacks the reciprocal nature of a true social network — plenty of feeds have thousands of followers but follow far fewer people in return themselves (do you think that Lady Gaga really pays attention to what you say?). One important consideration — Twitter’s a useful tool for campaigns, but its real political power may lie in what campaigns CAN’T do on it, which is to dominate the conversation. Twitter is truly a democratic medium (with a small “d”), and content and opinions spread on Twitter often find their way onto blogs and cable news and into newspapers. Twitter helps create the sea of information in which modern campaigns swim, and whether or not they’re active on Twitter themselves, it’s likely to shape the political communications environment in which they operate. A common perception of Twitter is that it’s an inherently trivial medium — it’s often spoken of as a way to tell the world what you had for breakfast. But in practice, normal people who fill Twitter’s “airwaves” with self-indulgent drivel generally don’t pick up much of a following (for celebrities, that’s unfortunately NOT so true). In fact, perhaps the most common single use of Twitter is to spread links to blog posts, videos, news articles and other pieces of in-depth content, making the 140-character limit less of an issue. In general, as in so many other parts of the online advocacy space, readers aren’t likely to pay much attention to you unless you have something of value to offer them. People who tweet too much trivia too often can find their followers dropping off in droves, so be sure to pay attention to the KIND of information you distribute. Not every tweet needs to be a haiku-like gem of wisdom, but it rarely hurts to think for at least a minute or two about your ultimate communications goals before messaging the world. How often people Tweet varies immensely — I have friends who’ve sent out 10 or 20 times more messages over time than I have, for instance. It really depends on what you have to say. Once you’ve established an initial base of content on Twitter, next start building your following. Unfortunately, short of being mentioned in the Twitter feed of someone famous, finding an audience typically takes time. Start by following the people you want to follow you — your staff, political activists in your state, district or area, local bloggers, journalists, etc., since at least some of them will follow you back right away. Once they do so, you have the opportunity to reach them — and potentially, their own audiences through them. Of course, you’ll want as many of your supporters to follow you as well, particularly if their own following is large and/or active. So ask them! A “follow us on social media” email is a nice break from a string of fundraising asks, and your supporters may appreciate a chance to help the campaign without having to open their wallets. The most effective way to build your following over time is to actively engage the Twitter community, a process that can take several forms. The most straightforward is to use an “@reply,” in which you reference another Twitterer in your own post (i.e., “@epolitics why don’t you just shut up about this crap”). You can use @replies to hold a back-and-forth conversation with someone, plus they’re a good way to get the attention of someone with whom you’d like to connect (Twitter.com and other Twitter-management tools — like Hootsuite — typically make it very easy to see who’s @replied you). @replies also play a role in “retweeting,” which is the forwarding of someone else’s posts to your own followers. Retweets are one of the signature characteristics of the ongoing Twitter conversation, since they let people provide value to their readers without having to write new content themselves. Plus, retweeting someone more prominent than you can be a good way to come to his or her attention, particularly if you use the old-school “RT @reply” method rather than Twitter’s newer built-in retweet function (RT’ing a tweet as an @reply also lets you add a comment, another valuable feature). Besides RT’s, the other common bit of Twitter shorthand you’ll commonly encounter is a “hashtag,” a word or abbreviation preceded by the “#” sign. Twitterers use hashtags to refer to a topic that’s being discussed by several people at once, for instance an issue, event or public figure, and people often use Twitter’s search function to follow the extended discussion around a particular tag. This tendency makes hashtags a valuable way to gain exposure to new followers and to find yourself retweeted, assuming of course that you have something interesting to say. Some websites attempt to keep track of common hashtags, but the easiest way to find the hashtags in general use is to use a Twitter search around a topic and look for the tags terms people are using when they talk about it. Engaging the Twitter community is obviously time-consuming, since you have to pay attention to what many different people are saying — you can’t participate in the conversation unless you’re actually listening. Besides hashtags, dedicated Twitter-management tools like Hootsuite and TweetDeck let you break the feeds you’re following down into various groups, for instance based on topics they cover or the kind of author they are (hint: track relevant journalists), and they also tend to speed up the process of posting content vs. going through Twitter.com itself. 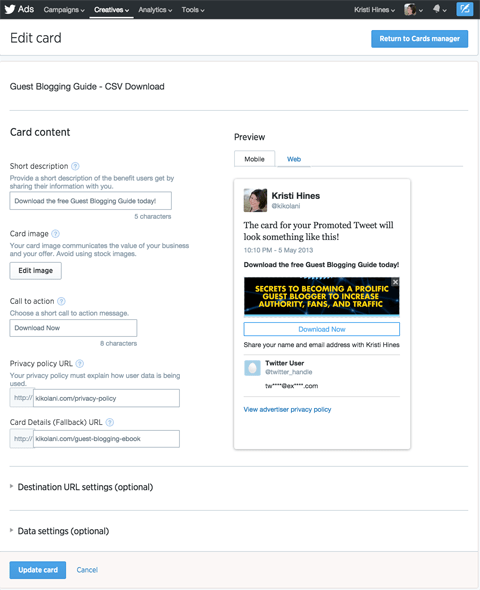 A good tool will typically allow you to pre-schedule Tweets for publishing, something that’s particularly handy if you have content that needs to go out over the weekend or while you’re traveling. Besides public conversations, you can also “Direct Message” someone behind the scenes if you are following each other reciprocally, and I’ve known people who’ve been able to connect with a blogger or reporter via DM whom they’d never been able to reach via email. Twitter has given rise to an impressive array of different tactics and practices in its short time on Earth. “Live-Tweeting” an event involves covering it comprehensively as it happens, and social media-friendly conferences and seminars typically promote the use of certain hashtags to facilitate the process. Activists or groups can also pre-arrange TweetChats, which are public discussions at a particular time and around a particular hashtag. Many people pay attention to the hashtags that are “trending” on Twitter, i.e., becoming widely discussed, and the goal of a TweetChat or live-tweeting is often to either encourage a topic to trend or to ride the wave of a subject that’s moving up the popularity ladder. Finally, a Twitter interview can be an interesting way to run a one-on-one public conversation, though it practice it can feel like competitive poetry or a freestyle rap showdown — i.e., a public balancing act on a very narrow wire. A common question about Twitter: why the 140-character limit? The answer is cell phones — Twitter is designed to be used like SMS text messages, making it one of the few online tools commonly and easily works on handheld devices. Some organizers have taken advantage of this fact to use Twitter to help rally communities in which cell phones are more common than access to the traditional internet. Others have used the Twitter/phone connection for on-the-spot coverage of rallies and other events, particularly as a means to distribute photos and videos shot with their phones. Finally, some campaigns in 2012 employed “protected” Twitter feeds — ones that can only be followed by people “approved” by the feed owner — to organize field staff and volunteers on the fly. 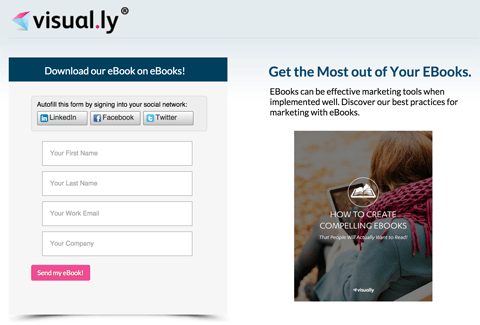 Update: this section has changed in the version 2.0 of this ebook, published in April of 2014! Please go toTwitter Advertising for Politics & Advocacy for the latest information. Another note of caution: electoral campaigns in particular need to be careful to distinguish between a candidate or officeholder’s Twitter feed and one updated by staff, since Twitter as a community tends to value authenticity. If Twitterers find out that a “candidate’s voice” is not actually his own, the campaign’s credibility can take a hit. Campaigns can use both approaches in a single feed if it’s clear whose voice is speaking at any given time, and can even turn a relatively rare candidate appearance on his or her own feed into an event to promote. Finally, don’t forget that once a campaign has a Twitter feed, people will expect to be able to follow it and interact with the author(s). Don’t start a feed and let it die of neglect. For more from this chapter, please download your copy of “How to Use the Internet to Win in 2014″ today. 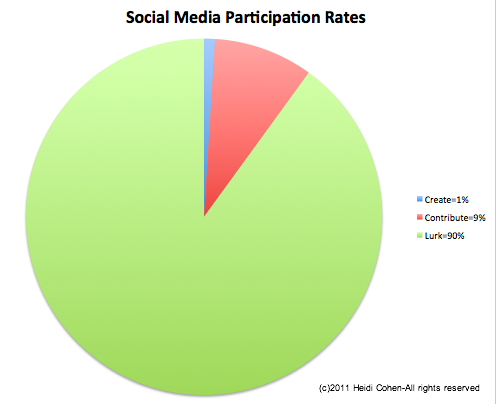 Political Social Media Campaigns – How and Why they can win or lose elections. Starting out, knowing the ins and outs of online networking can be a bit daunting for candidates. Here are a few tips for political campaigns are unfamiliar or starting out with the whole social media thing. Much of how campaigns have been using social media amounts, at best, to a waste of people’s time and attention, and, at worst, to relentlessly spamming your friends. Not only is this ineffective, you’ll likely be irritating some of your friends and supporters – and I know you don’t want to do that. Define your objectives: It’s amazing how often this step is bypassed. Do you want to use social media to communicate with your existing supporter base or grow your base? Do you want to raise funds, awareness or both? Knowing the answer to these question will have a lot to do with your strategy. I’ve seen campaigns hoping to grow (don’t they all? ), but using the tools as if they only wanted to be in touch with an existing audience. It shouldn’t have been a surprise that the online community didn’t grown much. Engage (a.k.a. It’s not all about you): Don’t just publish. If you primarily use these new channels to push out your “Come learn about me” events and links to your “Donate here” page, people will tune out pretty quickly. Don’t miss the important opportunities to talk with, not at, your audience. Doing this well will build your reputation and visibility. Public vs. Private: Know what content (information, photos, etc.) about you can be seen online by the many (everyone) or by the few (close friends and family). Then, assume that it all can be seen by the many and plan with that in mind. Connect the online and offline worlds: Most of your activities and content should have both online and offline components woven seamlessly together. This can range from posting photos on Facebook from an offline event to holding live events online allowing a large group the opportunity to interact in real-time, and everything in between. Fish where the fish are: People want to hear from you where they hang out, not where you want them to be found. The fish are on Facebook, Twitter, YouTube; not on your website. If you wait for the fish to come to you, you may be sitting alone with your pole in the water for a very long time. Get a running start: It takes time to build real momentum, so start early. Sure, you can easily get a certain number of Facebook fans or Twitter followers in a short period of time, but will they be the right ones? Would you prefer to be connected to more people who don’t care about you or your message or fewer who are engaged and interested? Damage control: Most people aren’t thinking about this as a top priority when they begin engaging through social media. We don’t really expect damage, so why would we be thinking about damage control? The fact is that, should something go awry or someone have something negative to say, it’ll be online in a heartbeat. If you’ve done a good job establishing your community online and have shown yourself to be authentic and responsive, you’re in a much stronger position to be able to respond to the situation in a faster and more credible way than had you not built your online presence so thoughtfully. It takes work: Social media is not a set-it-and-forget-it proposition. For some reason, many have the misconception that all that is required is the up-front work to set up a “presence.” In order for your online presence to work for you, it takes work – attentive, responsive, ongoing work. I’ve seen many people set up Facebook pages, encourage people to join and then allow it to go dormant, even when community members post messages or questions. This is akin to publishing your phone number, yet not answering when someone calls. On a list of 8 tips, this important one comes at no extra charge: This may not be the best job for the intern or your neighbor’s son: I’m sure the intern and the neighbor’s son are delightful people. They might even be heavy Facebook users. Just because someone does something often doesn’t mean they do it well. At speaking engagements, I often use driving as an example. I know people who have been driving for years, but when I’m in the car with them, my foot instinctively searches for the brake pedal on the passenger side. They drive a lot; they don’t drive well. Understanding best practices, the nuances of various tools, social media analytics and the pace and etiquette of the different social platforms are not simple tasks. There is too much at stake. Find (or hire) the right person to help you leverage the potential of social media and taking your campaign online – where the fish are. Running a campaign isn’t easy. It takes a dedicated team to develop and execute the campaign’s strategy. 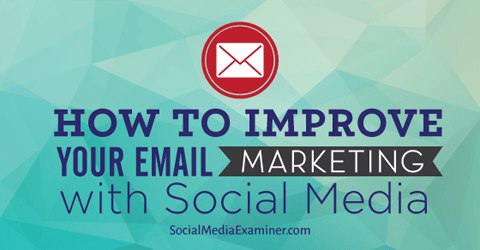 You don’t need a separate social media strategy. 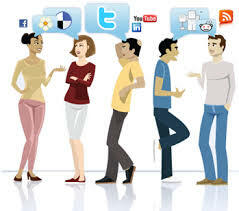 What you need is a good understanding of how to use social channels in a way which supports your campaign strategy. Understanding why this is important and how to execute this will go a long way toward having the candidate be every bit as compelling online as they are in person. 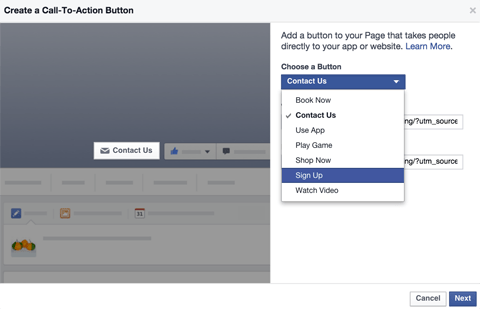 You know how to set up a Facebook account, you have even boosted posts so really how hard is Facebook marketing? 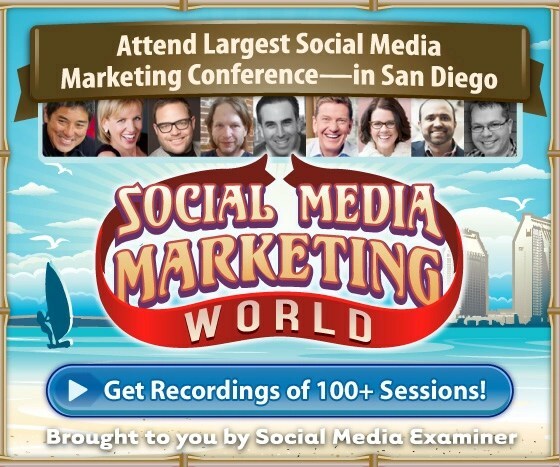 What sets a true social media marketer apart on Facebook? Quite a few things actually, but mostly it’s their holistic vision and appetite for information. 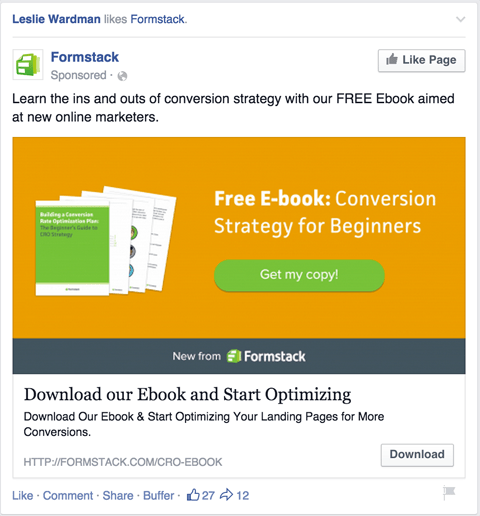 Here are a couple of examples of things pro marketers do on Facebook that other page admins most likely don’t. 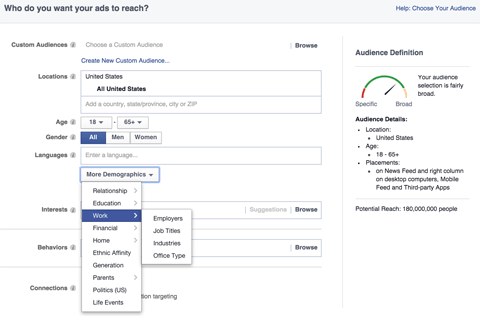 Since its release, Graph Search has been refined and updated to function as a semantic search engine, making it an even morevaluable tool for Facebook marketers. 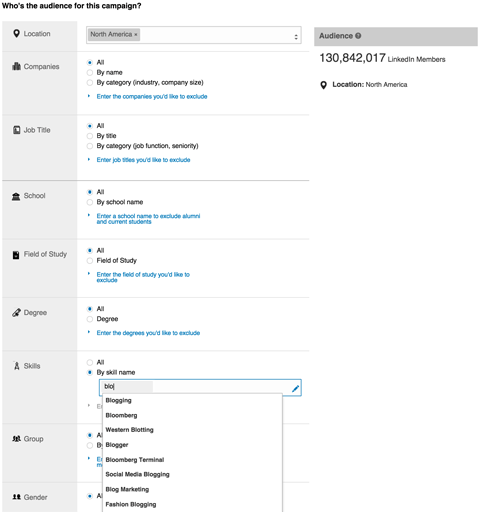 Now search results are indexed by Facebook (rather than Bing) and include people (both friends and people in a person’s extended network, i.e., friends of friends, people with similar interests and people nearby), posts, hashtags and locations, according to a post by Lior Degani on Social Media Examiner. Mass mobile consumption is the future, and pro-level Facebook marketers are the folks who know this best. This is perhaps the most important point of all. Pro Facebook marketers, who are also likely pro Twitter, Pinterest, Instagram, email, etc. 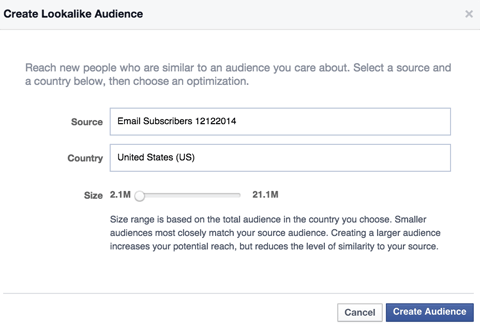 marketers, know they can’t rely solely on Facebook to promote their business. So when Facebook decides to change their algorithm in a way that does not favor content from brands, pro Facebook marketers don’t panic. Why? Because they don’t have all their eggs in one basket, and they know that they can lean on the other social platforms and marketing channels they’ve developed. 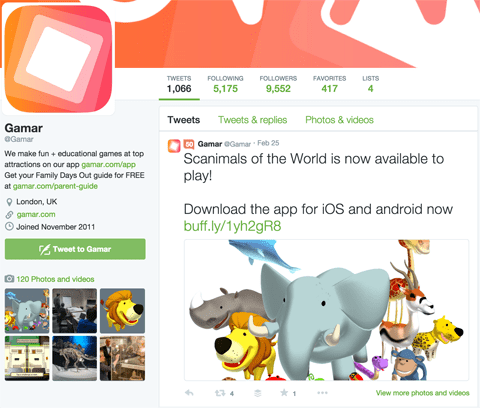 Want to discover how to engage more users on Twitter? Have you considered using psychology techniques? Using some psychology tips in your tweets can make your Twitter feed more interesting and your followers will be more likely to engage with you. In this article I’ll share six psychology tips you can use to create tweets that’ll engage your audience. 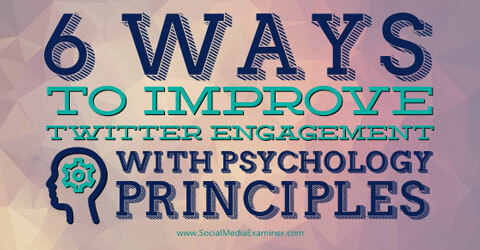 Learn 6 ways use psychology to improve twitter engagement. The methods used to construct language and motivate customers often stem back to basic psychology, which is something used to persuade, engage and influence buyers. For example, using rhetorical questions at the start of Twitter ads or general “sales” tweets might work well for you. The tweets will engage users and make them consider how your product or service could benefit them. Here’s how you can improve brand recognition, catch the attention of more users and increase the number of clicks, retweets and favorites that your tweets receive. Humans are innately social beings; we’re born with a powerful psychological need to belong. This dates back to our ancestors who lived at a time when it was best to live in groups to ensure a higher chance of survival. Although society is different now, identification with and a sense of belonging to a group or organization are paramount to our well-being. Psychologists say that there are three primary groups that people aim to associate with: groups to which they’d like to belong (aspirational), groups that share the same ideas and values (associative) and groups to which they don’t want to belong (dissociative). The language you use within your tweets can help users identify with one of the three primary groups. As a result, they’re more likely to respond. York Hornets used an aspirational tweet to encourage followers to become part of their team. In the aspirational tweet above, a cheer team recognized that some of their followers might want to try out for their team. It uses that desire to influence them to join their Facebook group. 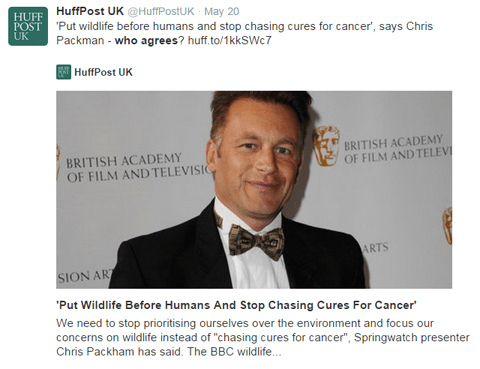 The tweet below from the Huffington Post uses the values of association to engage users and encourage them to respond to an article. The tweet asks if followers agree with a strong statement. Users will reply, retweet and click through, as they try to decide which side they are on. This controversial tweet uses the value of association to encourage followers to respond. 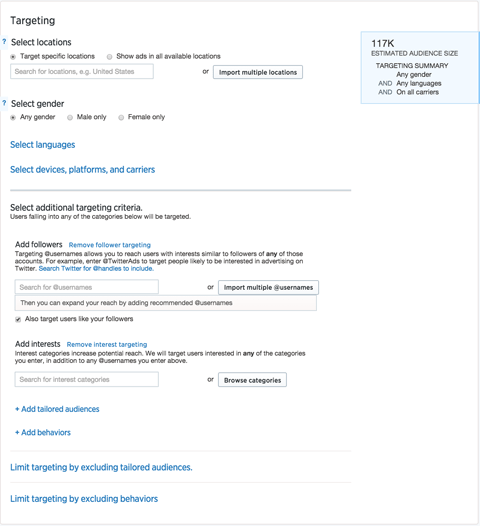 The language used within tweets can also help customers make a dissociative connection to a competitor, and as a result, a better association with your brand. Technology companies often compare their product to a competitor’s spec or an older product, and receive excellent engagement. 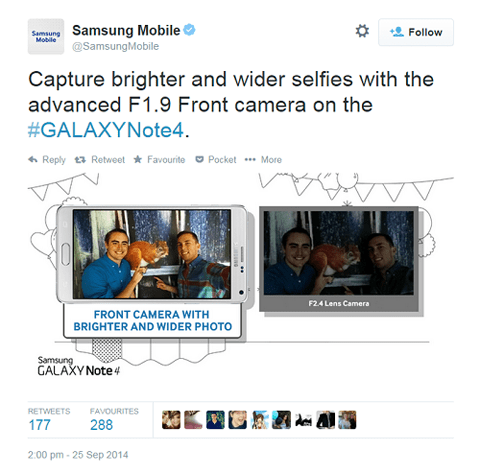 In an attempt to gain customers Samsung compared two products, showing its product as the better choice. Anyone viewing the above image from Samsung would want to associate themselves with the newer camera and improved image, rather than the old one. Key Takeaway: Use Twitter to link your products and services to the three primary groups that customers respond to: aspirational, associative and dissociative. This will promote higher engagement, as well as cultivate users who have an affinity for your brand. Many marketing and advertising studies have been conducted to see what type of images have the highest conversion or click-through rates. In nearly all studies, an image of a person, particularly a close-up of his or her face, increased the success of the ad or the web page. Apply this research to your Twitter strategy. Tweet images with faces. And be sure tohave a nice headshot on your Twitter profile. 37 Signals conducted a test that looked at different variations of the Highrise home page to see which one converted the most visitors to paying customers. 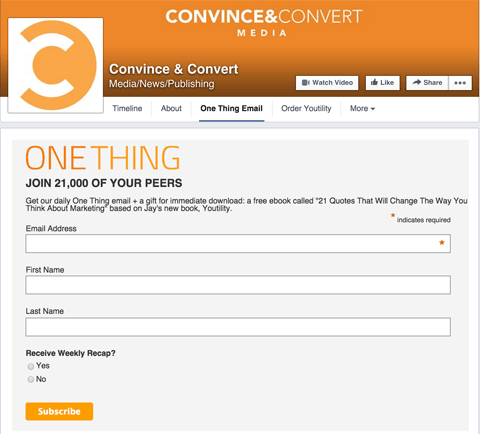 They found that a page where they included an image of a person created a 102.5% increase in signups. 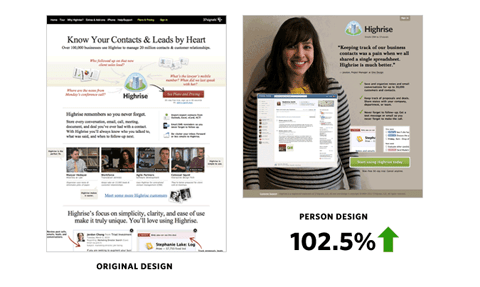 The landing page on the right, which used a person’s image in the design, increased signups by over 100%. To make your brand more recognizable to your Twitter audience, head up your profile image with the face of the company, such as the CEO or founder. This will make that person more recognizable to the audience, which is an especially important tactic for a new company. Even for a SaaS company, where there is no obvious “person” to sell, it’s useful to include images of happy customers within individual tweets, particularly those linking to blog posts or case studies. The effectiveness doesn’t really come from who is in the image, it’s more about what the image conveys to the reader.